I spent a very enjoyable 90 minutes at the Orange Bull Bar in London on Sunday afternoon watching Rozanne Gewaar delivering her fragile and introspective tunes for a small but appreciative audience. She was in London just for the weekend on her way back to the States (where she currently lives) from Amsterdam where she played earlier in the week. The intimate setting belied the fact that the Orange Bull is known more as a rowdy sports bar catering for South African expats and a growing number of London locals developing a taste for ‘braai’ cuisine (hopefully they’ll add a few vegetarian dishes to the menu soon as well) and rugby on the big screen. However the venue has a fair-sized stage and ample stage-facing seating to make it a great venue for South African music, which the proprietor, Gunter, tells me is precisely what they’re aiming to do. Hopefully the knowledge of venues like the Orange Bull – which are geared up for live music – will attract more South African acts to London. Gewaar performed a selection of tracks from her three albums, a mixture of English and Afrikaans songs, and was later joined by another guitarist, and then another, who added a more robust backdrop to her own gentle playing. 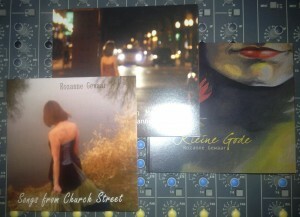 Rozanne kindly donated a copy of each of her three CDs to the Tune Me What? library so listen out for more of her music on future shows. The albums are all available via Bandcamp. Visit Rozanne Gewaar’s website to find out more about her. During our chat on the current episode with Ivor Haarberger – the former head of Gallo in South Africa – the fact that the company made guitars (and other items) as well as records in its early days came up. I mentioned that David Kramer sang of a “Gallo Guitar” in his song chronicling the early rockers called “Budgie & The Jets” and thus the instrument had its place in SA rock mythology. What I didn’t know was that it also had a place in international rock ‘n’ roll iconography. Ivor pointed out that there was a Beatles connection. And so there is. 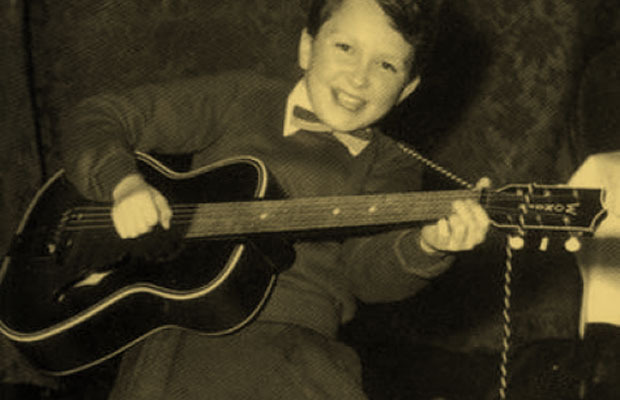 This photograph of a young John Lennon is famous, but I bet you didn’t know that he’s clutching a South African-made Gallotone guitar. I didn’t! 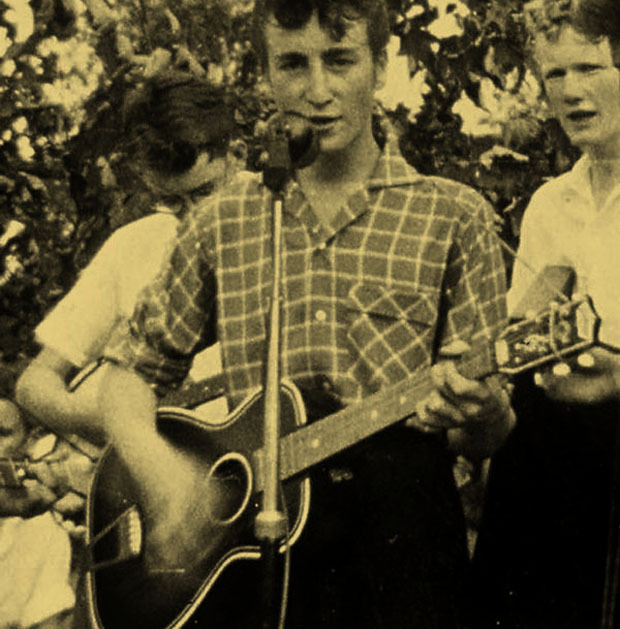 John Lennon, with the Quarrymen performing at St. Peter’s Church fête in July 1957. 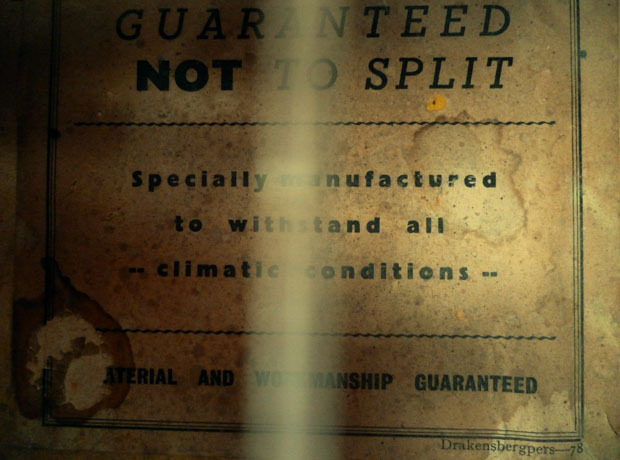 Doing a little research on the Gallotone guitar (there isn’t very much) I discovered that another rock colossus started out on a guitar from a factory outside Durban with the marketing slogan: “guaranteed not to split” . The tell-tale sign of an authentic Gallotone guitar. Now you may be wondering how these South African guitars become seemingly so popular in Britain. The answer is that in the 1950s there was a Board of Trade ban on the import of American goods into the UK, and even when it was lifted the duties were quite heavy making Gibson and Fender guitars too expensive for aspiring teenage rockers. In contrast, cheap guitars made in the Commonwealth were very obtainable. There is one small inaccuracy in David Kramer‘s song, however. When he sings that Budgie played ‘a Gallo guitar’ with a home-made amplifier and used the whammy-bar like ‘Hank Marvin’ he’s taking a bit of artistic license: Gallo never manufactured electric guitars, “only acoustics,” Haarberger reminded us. Catch the episode where we chat to Ivor Haarberger the here.